I couldn't wait until September to get back out there and paint! 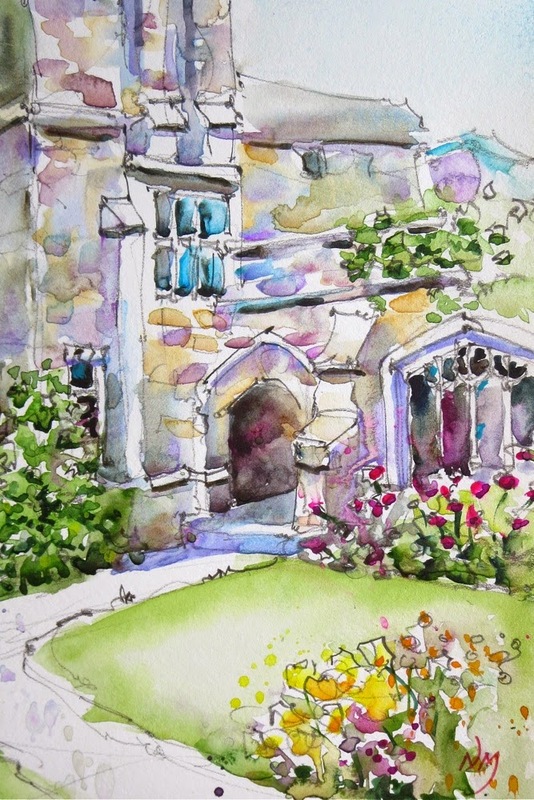 I cycled over to the University of Toronto's Knox College and painted in the beautiful courtyard today. I really enjoyed painting these big bold roses. I named them after the summer we've had, bright and breezy. And now... I'm on vacation. See you in September. It's nice to have a touch of pattern in a painting. Even if it's painted loosely, like on this little cup, it's a lovely bit of decoration. There wasn't much sunshine on these echinacea so, I went with lots of colour instead! Below is a pic of my paintbox, which sits on my lap. Lots more examples of me using it on my Flickr Page. Lately I've been working with white objects, mostly flowers, for my daily paintings. The subtle values in the shadows of white are a real challenge. I like adding a strong colour, like the orange here, as a contrast. Here's my ice cream painting for this weeks Daily Paintworks Challenge. It was really fun to do. I kept is as loose and light as possible. Back out there! I love painting at the Toronto Botanical Gardens with the lovely ladies, (well... yesterday it was all ladies) from the Toronto Plein Air Group. Here is a pic of my trusty paintbox which sits on my lap. I may try to do this one larger in studio. I'm very happy with these backlit flowers and lemon.